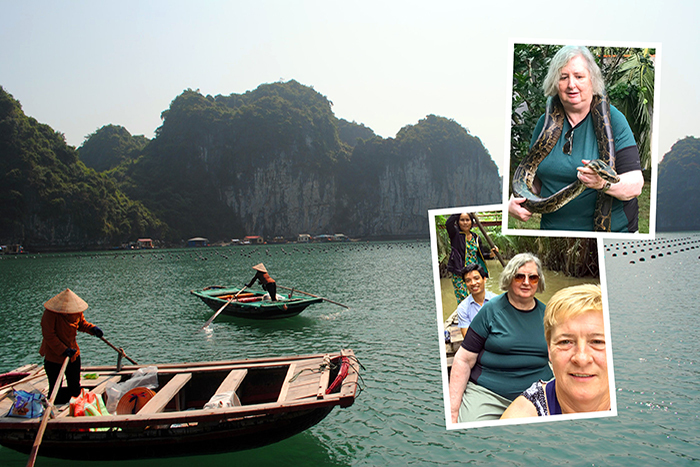 Ayrshire local, Margaret Sancken enjoying Vietnam with a new reptilian friend! Do you remember your first holiday? The excitement of researching sightseeing activities and looking up places to eat and stay is half the fun of a holiday as you daydream about the sun from drizzly, grey Britain. The possibilities seem endless – pasta in Italy, skiing in the Alps, trekking in Nepal and star-gazing in Hollywood. We all need a holiday now and again. Yet, for those with disabilities, holiday planning can feel like a daunting task. There are practicalities to figure out, like transportation and disability accessible hotels (and swimming pools! ), and even knowing where to begin with researching your holiday can be enough to put a damper on it. It’s enough to put you off the whole thing altogether! This was how 65-year-old Ayrshire local, Margaret Sancken, felt before her holiday to Vietnam. Unsure of how to research her very first trip abroad, Margaret was able to use a specially designed system, CleverCogs™ thanks to her care home, Blackwood. CleverCogs™ is a bespoke device that is tailored to each individual user. Blackwood designed the technology so that their residents can have as much independence as possible and feel in control of their lives. The device allows its user to browse the web, email, catch up with friends and family, and even hit the online shops! This way, your holiday is stress-free and you can enjoy it properly. Margaret used CleverCogs™ to plan her trip and to book flights and hotels, and she says that it was the technology that gave her “confidence to try new experiences” and go on her first holiday. On her trip to Vietnam, she was accompanied by Gina McClinton, a Blackwood’s Team Leader of Margaret’s care home at St Leonard’s Court. The pair had a once-in-a-lifetime experience, visiting sights, such as the Hai Van Pass, a cruise down the Mekong Delta, and even going to a coconut candy factory! How amazing does that sound? Margaret and Gina were also welcomed into a local family’s home for dinner, where they had a seven-course feast of Vietnamese delicacies and cuisine. Delish. Who doesn’t love pho? Now back home in Ayrshire, Margaret has been bit by the travel bug and is already planning her next trip with CleverCogs™. Her next adventure? This time it’s the Australian outback! Be the first to comment on "Accessibility On Holidays Won’t Hold You Back With CleverCogs"